Traditional patchwork and simple piecing really is my "thing" ~ where I am in my element and can spend hours cutting fabric, sewing and pressing (and trimming) and not at all be bored by the repetitive tasks. Sometimes I watch a movie, or listen to music, sometimes it all happens in quiet contemplation. 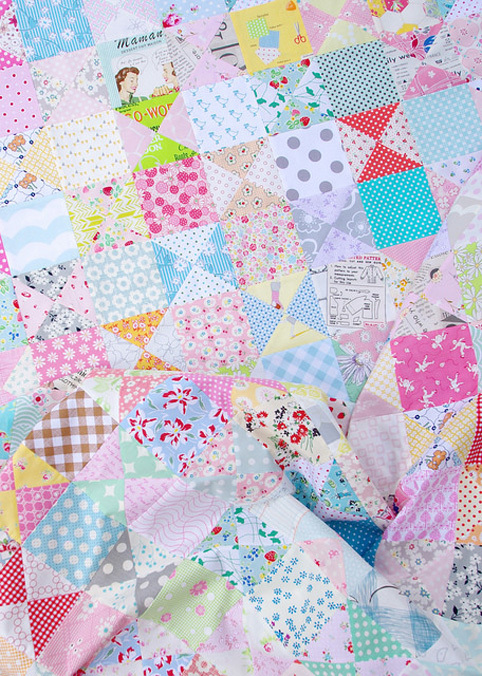 Every block is different and the variety in fabric combinations alone is enough to hold my interest. This quilt is based on traditional patchwork units and the Ohio Star Block with variation (I've marked the Ohio Star Block block as it tends to get lost in the design if you are not sure what you're looking for) and is inspired by the Bee (Swap) Quilt by Karen from Blueberry Park. In effect, this quilt is created by alternating a square with an Hourglass Block. 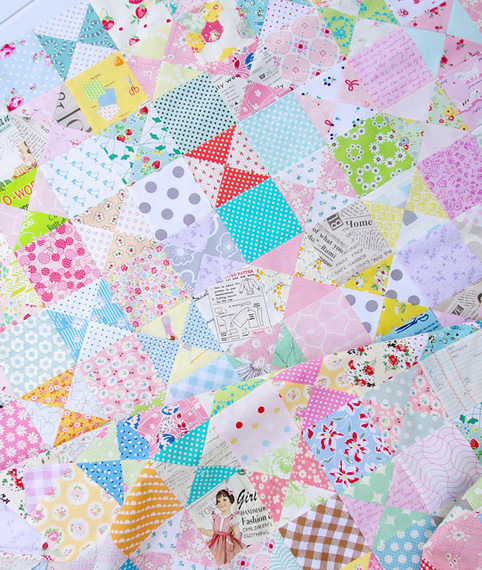 It is super simple but really effective and it is the perfect scrap project. I've made up my own block sizes (which can easily be adjusted to whatever block size you prefer to work with) and started cutting fabric late last week generally from stash, although I like to think I have used up some of my scraps. It doesn't look like it when I look at my scrap bins. I have used an easy piecing method for my Hourglass units (making 2 Hourglass units at once) in the same way that I have documented in my Hourglass Block Tutorial (when working your way through the tutorial please remember that you're making 4.5 inch square Hourglass units - from 5.5 inch squares of fabric - and that as always it is worthwhile to make a practice block before cutting all of your fabric. Too easy. 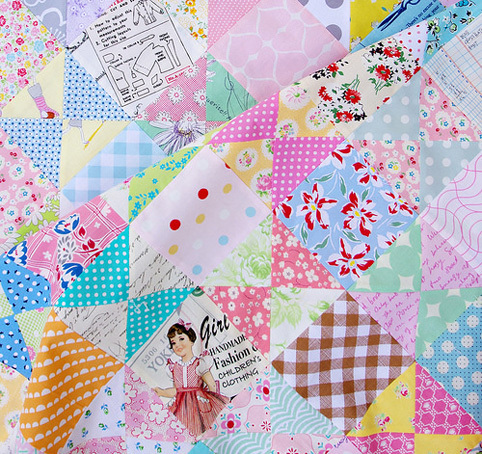 Alternate a Square with an Hourglass unit and sew together in (horizontal) rows. and the quilt top measures 56.5 inches x 68.5 inches. Your work is so inspiring. I'm working on my first (solo) quilt currently...pre-cuts and straight lines and I'm still having some issues haha. Gotta learn somehow! Hopefully down the road, I'll be able to tackle something like this. 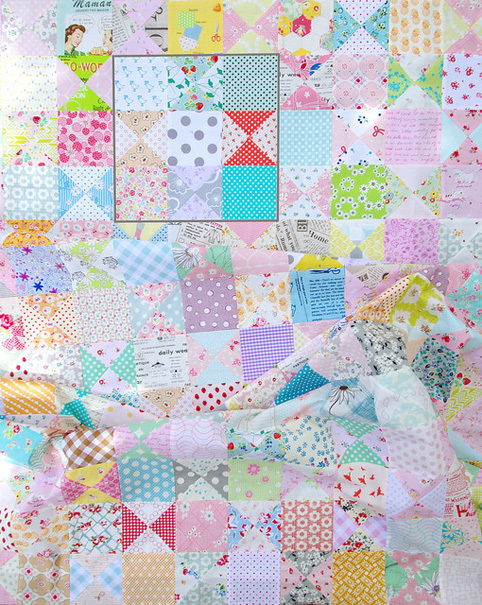 As always, wonderful fabrics and piecing on this quilt Rita and thank you for the pattern, plan to make one like this soon! I too love traditional and repetitive quilting of beautiful fabrics while enjoying my other loves ... audio books, podcasts and music with an occasional Food Network/HGTV show thrown in! What's great about this pattern is you don't even have to worry about getting a block in the right direction as long as you remember to alternate! You always find such a great way to transform traditional blocks into something so new and fresh and another one on my bucket list. Thanks for the inspiration. I wish I could sew all day and night. Love your way of putting fabrics together! 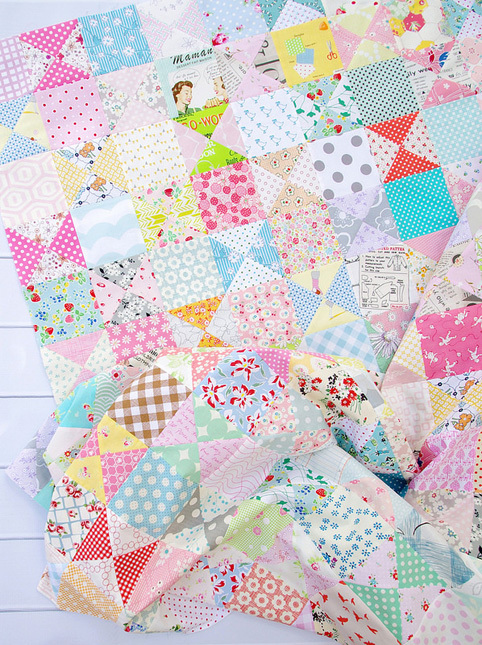 Love this quilt, simple but wonderful! You must have the biggest scrap bins on the planet! Beautiful as always. I just love all your fabrics. Glad you showed the OHIO star...I was havin trouble seeing it.